Over the past 10 years Swap-bot has gained more than 65,000 accounts, facilitated more than 200,000 swaps, and received 280 MILLION pageviews! It blows my mind. For this swap: You will have just one partner to whom you will send one piece of Swap-bot-themed mail art. It can be a postcard, letter, or parcel, but it MUST be decorated externally with a Swap-bot theme. Think blue and orange, postal mail images, Ernie the Envie, swap terms, etc. Put some time into making something that will delight our mail carriers! It is not required, but it'd be fun to include a note or goodies with your mail art for your partner. New swappers and experienced members with a 4.9 rating, or higher, are welcome to join this international swap. As always, I will check over participants and remove anyone questionable. Please take a photo of your mail art and email it (or a link to it) to me at rachel -at- swap-bot.com. I'd LOVE to share your creations on the Swap-bot blog! I've made this a very easy and inclusive swap so that everyone will feel comfortable joining and celebrating Swap-bot. Also, I WILL ANGEL THIS SWAP. Please let me know after the send deadline if you have not received a swap item. Once you rate your partner honestly with a 1, I will send a fun piece of mail right out! Swap-bot's awesomeness comes from our amazing community of swappers. Thank you all for swapping with us and supporting us for the last ten years!! Feel free to grab this graphic to use on your blogs, twitter, instagram, etc to spread the word about this swap! Congratulations on ten years! I am thankful that you two created Swap-bot, and grateful for all the work you both do. Congratulations! So happy to have been a part of this site from the start! Thank you to you and Travis for starting it and for all the work you do for it! Super excited for this swap...it means I will be able to use an Ernie stamp that I hand carved just to help promote the site when I am shipping to my partners! Congratulations on your 10th anniversary and thank you for creating a wonderful site! I thank you every day for creating this wonderful place. I have only been a member for five years, but hope to be here for many, many more. Thank you all for your kind words and for joining my swap! love to join no crafter . Congratulations on 10 years! I love swap-bot, thankyou. thanks Rachel and Travis for bringing so much fun and excitement in to my life. Congratulations on 10 amazing and fun years! Thank you for giving us the opportunity to share our crafting skills with other wonderful swappers. Many blessings to you @racheljohnson & Travis for all your hard work. Congratulations to 10 fabulous years! I truly love swap-bot. Thank you so much! Thanks guys!! We love Swap-bot and just hope to keep making it better... can't believe it has been 10 years... but here's to 10 more!! big congrats to rachel and travis. 10 years is awesome. yay I adore this site I am so in!! Thank you for the creation of this site. But I would also take the chance to thank all those who make their contribution to make this site an awesome place by being awesome hosts and swappers - and to those who work hard to make this site a little safer for everyone. I think you know who you are. So also a big thanks to those awesome ladies. Started with the 200,000th swap, so it is with pleasure I'm joining the 10 year anniversary swap! Having SO MUCH FUN with this swapping community. Thanks for all your hard work! Thank you for creating this site! Thanks to all fellow crafters/swappers for sharing your talent and cool junk with me! I can't imagine being a part of this site and not signing up for this swap! I'm soo excited for it! Happy crafting everyone! Took a a while longer than your last swap but congrats on the top spot. I love swap-bot. Congratulations on 10 yrs. And I hope there are many more. A mobile friendly site would be very nice. We need an app for that. I find the current platform to be fine on my iPhone. I only like mobile platforms if I have to option to opt out! Thank you so much for starting Swap-bot!!! I was lost without any means to send snail mail out to random people!!! ALL MY LOVE! Wishing you many more years of success! Only been in Swap-bot a year now, but it's great fun. I've hosted 20 swaps and my latest is number two in the Top Swaps, behind yours. It's also interesting to participate in some swaps, you can never be quite sure what you'll receive. Thank you for starting Swap-bot, I love it! Happy 10th!!! Looking forward to many more. Hi, I'm hosting a swap and wanted people's opinions. There's nothing wrong with me asking newbies to fill out their profile is there, if they haven't written much about themselves? Thank you. 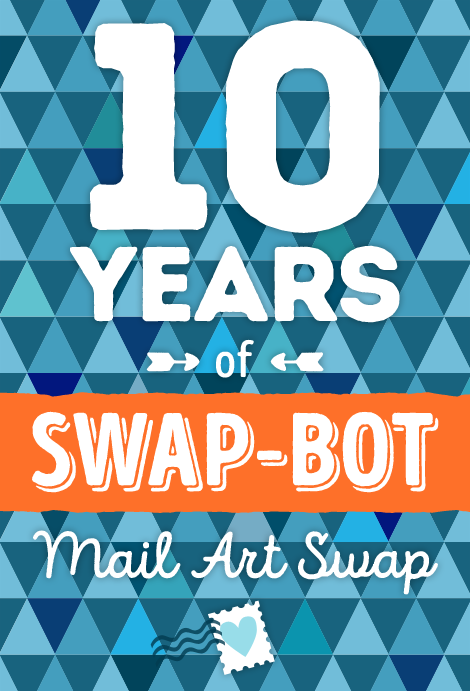 Congrats on 10 years love Swap-bot Thanks for all you do to make this a fun and safe place to swap ! Not a crafty person either but just wanted congrat you for 10 years and going strong!!! Thank you all!! I am excited that this swap has grown so large. I just extended the sign up deadline to Friday, October 2nd, so hopefully we can get in as many participants as possible. Thank you for creating this fun and addictive site. I have swapped with over 650 people in the last year and a half and I am having the best time! any gallery images from the 5 year anniversary swap? Would love some inspiration. It is not all mail art, but if you visit this blog link you will see lots of awesome Swap-bot-themed art from previous swaps. I love it all so much! Partners are assigned! Let's start swapping!! Congrats to you Rachel and SB and to all of us too! PAM/Druideye, be safe and dry!!!!!!!!!!!!!!!!!!!! Rachel, are ATC's considered mail art?? Great idea. Congratulations on ten years! Today is the final day to mail your swap! @druideye - contact your partner and let them know your situation. I am sure they will understand. And stay safe!! @Crazipurplelady - An ATC mailed inside an envelope wouldn't really count as mail art. Decorate the outside of the envelope or postcard that you send. Mail art envelope went out to my partner today. Enjoy!